Gregory Maestri is an associate with the firm. His practice is focused primarily on civil litigation in the real estate industry, representing owners, developers, landlords, property managers, and other professionals. In addition to litigated matters, Mr. Maestri advises the firm's clients on various business issues, including formation of business entities and contract negotiations. 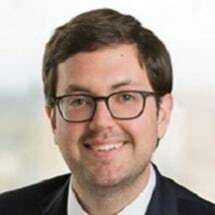 Mr. Maestri received his Juris Doctor in 2015 from the University of California, Los Angeles School of Law, where he served as a managing editor for the UCLA Journal of Environmental Law and Policy. While in law school, Mr. Maestri was part of the negotiation team that placed third in the California State Bar 16th Annual Student Environmental Negotiations Competition. Prior to joining Goodkin APC, Mr. Maestri was an associate at Early Sullivan Wright Gizer & McRae LLP, where he represented clients in all aspects of real estate and commercial litigation. Prior to attending law school, Mr. Maestri graduated with a Bachelor of Arts in History from Boston College in 2010. Mr. Maestri is admitted to practice law in California and Florida.